We would like to invite you to the House of Pacific Relations International Christmas Cottage Festival at Balboa Park's "December Nights" which will take place at Balboa Park. 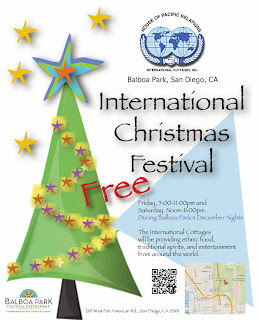 We will once again be serving our premium Panamanian Drinks at the International Spirits Beer Garden: Ron Abuelo, Seco Herrerano, Carta Vieja, Spiked Egg Nog, and shots of Kentucky Cream Whiskey (yes, Panama makes whiskey too). Our dance group, Sonares de Mi Tierra will be performing on the House of Pacific Relations International Cottages Stage around 5:00pm.